Dip charts are used for converting a dip value to a vessel volume. Vinsight has built in support for dip charts that let you enter a dip value and have it convert to a volume directly in the winery operation you are working on. 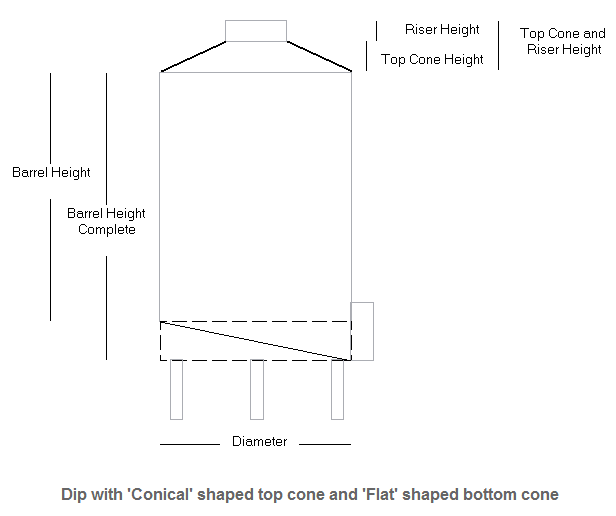 Dip Charts can be applied to either a specific Vessel, or an entire Vessel Type. If you have defined a Dip Chart for both a unique Vessel and it’s type, then the Dip Chart for the unique Vessel overrides the one defined for the Vessel Type. You can create dip charts in Vinsight using one of two methods. The first is called Dip Chart Entries, and the second is Dip Chart Calculation. To get started, head over to the DipCharts in the Settings > Make area. 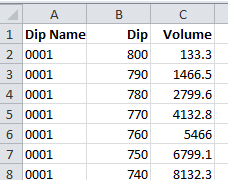 This method takes line items that match a known dip with a known volume. These values typically come from the manufacturer of the vessel. They can be entered in the “Dip Chart Entries” while editing a Dip Chart. This method takes certain parameters of the vessel you are creating a Dip Chart for you and uses them to calculate dips and volumes. 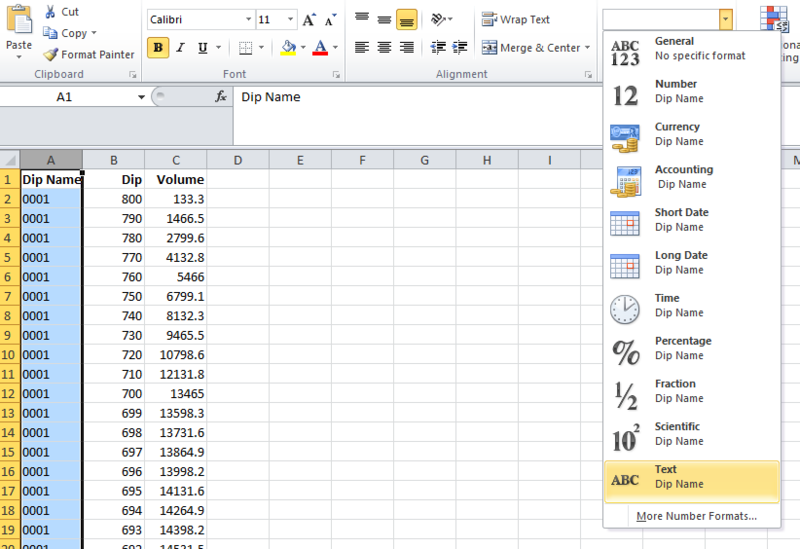 The units for Dip and Volume are what you specified when creating the Dip Chart earlier. Dip Name must be the same as what your Dip Chart says. Now go File > Save As. Choose CSV and save the file somewhere easy to get to. Once it has saved (you will need to say yes to some confirmation boxes), go to Vinsight and press “Choose File”. Navigate to your saved .csv file and select it. The contents of the .csv file should now be in the “Data to Insert” box. Note: You don’t need to specify every single dip entry in the table. For example if you specify every 10, and you ask for a dip that is between two entries, Vinsight will extrapolate for you and work out the correct volume based on the information it has. 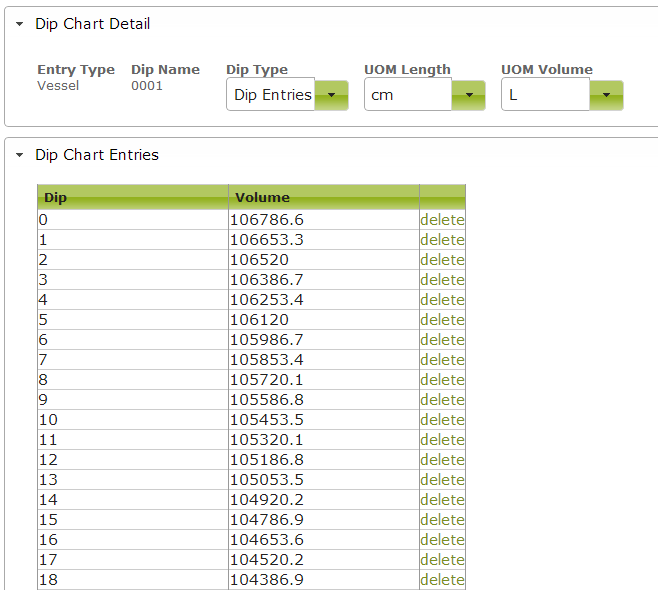 Now go to your Dip Chart detail view and check that the entries have appeared as you imported them. Here you can select a Vessel, and then insert a Dip value. Once the Dip Length or Volume inputs looses focus, the Dip will be calculated and shown in the other box. As you can see, Vinsight has taken the Volume for 750, and the volume for 760, and used them to calculate the volume at 755.